We’re located in beautiful Celebration, Florida. We have been in business since 1999! We started with our showroom and expanded to our online store in 2009. What is the procedure once we order? We will email you a confirmation/receipt. Please read it over carefully to ensure the information is correct. If we don’t hear from you in 24 hours, then we will proceed with your order and have the manufacturer get started building your stools. Within a week, we will send you an email with an estimated shipping date. When we get the confirmation that the order is shipping, we will then let you know and give you the tracking information for your delivery date. What are the shipping times? Are there any shipping costs? Shipping times vary from manufacturer to manufacturer. Custom orders usually take longer than in-stock items because they are made to order by selecting metal finishes and fabric colors. See here for our shipping table. There are no shipping costs for any of our products in the Continental US. There is also free shipping to Canada if you’re purchasing any items from our manufacturer, Trica. However, if you’re in Alaska or Hawaii, we will have to charge for shipping. We typically use UPS, Roadrunner Transportation, and FedEx. When my items ship, how long does it take until I receive them? When we send you an email with a tracking number, usually it takes a few days up to a week to receive them. I live in Canada. Can you ship to me? Yes, however the only manufacturers that can ship to Canada are our Trica, Holland and Woodard brands. If you’re ordering from Canada, please call us at 610-737-5693 or email us to place your order. Additional shipping fees may apply. I live in Alaska or Hawaii. Can you ship to me? For any Callee furniture, yes, we can ship to Alaska or Hawaii, however additional shipping fees may be applied. Please first, let us know your shipping address so we can let you know if there will be any additional fees. For our other manufacturers, we recommend you have the furniture shipped to a location in the United States and have a freight carrier forward it to you. With this route, you won’t be charged shipping to deliver it to a location in the US, but you will have to pay to get it forwarded to you in Alaska or Hawaii. I need help selecting the colors for my stools. Can you help? Absolutely! Deborah has been a designer for over 20 years and would be glad to help you. She has all of our fabrics and metal finishes at the office, so she would be glad to sit down with you and help you find the right combination for your stools. You’re welcome to email her or call her directly at 610-737-5693. Do you have bar stools made for the outdoors? Yes, we do! Please see our outdoor bar stools category. Do you carry 34″ or 36″ outdoor bar stools? Unfortunately, we do not carry any 36″ outdoor stools. Should I get arms or go armless on my stools? For this commonly asked question, the answer requires a few measurements. Keep in mind that stools with arms add 2-3 inches on the width of the stool. Arm stools also tend to be tighter, getting in and out of. 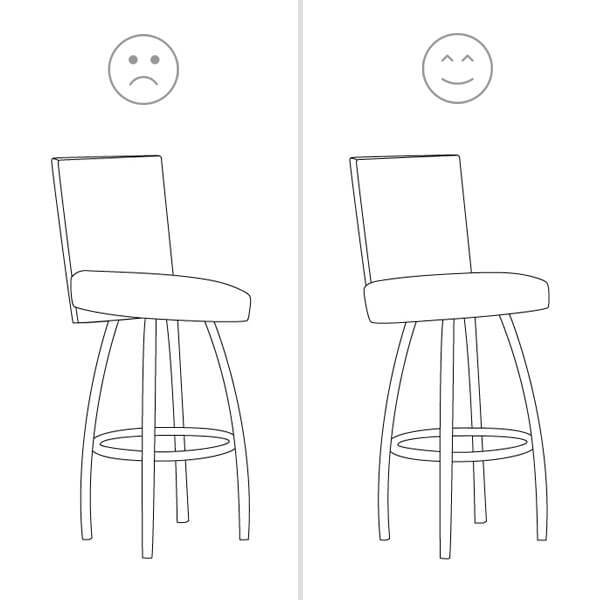 For example, the stool would need to be turned at a wider angle to enter and exit. Arm stools are great when entertaining. When sitting at the counter for a length of time, arms are great for relaxing. You can sit back in the stool and your arms won’t be dangling. A stool with no arms, however; gives the illusion of more space and less clutter. You will be able to fit more stools with no arms around the counter than stools with arms. Do you have stools where the backs can fit under the counter? Yes, we do! The Barry, Refine, Rival and Ronny from Amisco. Even though they have low backs, they will still give ample back support and they will not hit the counter when you push them under. It’s recommended to please measure your counter and double check the measurements listed on these product pages. What is the difference between a standard seat and a comfort seat? Standard seats are approximately 1½ inches thick with a semi-foam core. Classic seats are approximately 2 inches thick with a softer foam core. What is the difference between a memory-return swivel and a 360-degree swivel? A memory or a return swivel simply returns to the center position after someone gets up from the seat. A 360-degree swivel stool remains in the position you leave it when you get up from the stool. We recommend a 360-degree swivel stool because the stool won’t be pushing against you like on a memory-swivel. A memory swivel will want to return to the center even while you’re on it. Do your stools come with pads/glides on the bottom of the feet so they don’t scratch my floor? Typically, tile or vinyl floors require just the plastic glides that come with your stools. Wood floors typically require you to put a stick-on felt on the bottom of the plastic glide. This can be purchased at any local hardware store. Due to the amount of different flooring today, we suggest you call a flooring company and ask them what they recommend to use on your particular floor. Can I get a 34-inch stool? Yes, many of our brands carry 34-inch stools. With the best quality in comfort, these brands are the most popular steel stools. Can I get anything higher than a 34-inch stool? Yes, currently Holland Bar Stool makes 36-inch high bar stools. This is the ideal height for a 48 to 50-inch high counter. Can I use my own fabric, vinyl or leather on your bar stools? Yes! Our manufacturers accept C.O.M. (customers own material), except for Amisco. However, not all of them accept leather, as the process of upholstery leather can be difficult. The following manufacturers accept leather upholstery: Callee, Fairfield Chair, Trica and Wesley Allen (bonded leather). Please note: extra fees may apply. Can I buy an extra yard of fabric? I want to upholster my pillows, curtains, etc. with it. Yes, most of our manufacturers allow you to purchase extra yards of fabric or vinyl. Below, is a list of the brands that you can purchase fabric or vinyl from. Would you like fabric from a brand not listed here? Just ask us! I’m not leaning back in my stool, but I’m leaning forward (or sideways). How do I fix this? If you’re getting something like this (see below) on your stool, then you may have attached the swivel plate incorrectly. That way, your stool will be aligned correctly, and you won’t feel like you’re going to fall forward, but you’ll be sitting back a bit. 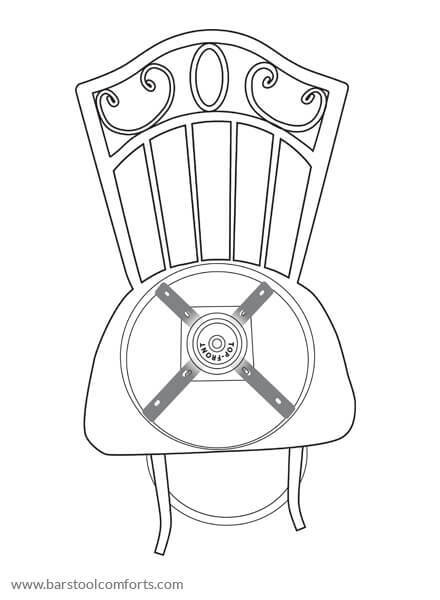 How do I prepare the 360-degree swivel mechanism to attach it to the stool? Push down on the swivel and turn the top piece to the left or right to form an X.
I just received my stools, but it’s hard to swivel them. Will they loosen up? When stools are new, the swivel mechanism is always going to be a little tight. They will definitely loosen up over time.